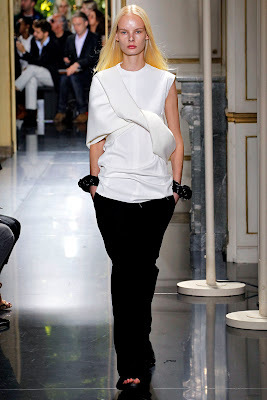 Dutch newcomer Irene Hiemstra was the surprise package of the Spring/Summer 2013 season. Amongst a sea of pretty faces, Hiemstra was a clear standout due to her striking unconventional good looks which challenge more traditional concepts of beauty. While Inoubliable Model Army can certainly appreciate a classically beautiful face, models in the ilk of Hiemstra who are not your standard cookie cutter beauties, truly strike a chord which resonates long after the final turn on the runway. 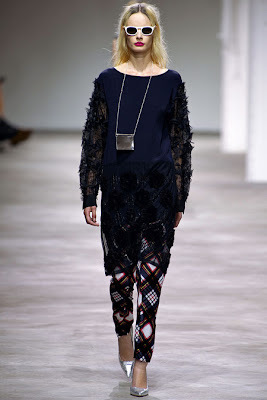 Represented by Paparazzi Model Management in Amsterdam, Hiemstra made an indelible impression with select appearances during the Spring/Summer 2013 season at Dries Van Noten, Céline, Alexander McQueen and Pedro Lourenço. Even more impressive is the fall out following the show season which saw Hiemstra nab a coveted spot in the Spring/Summer 2013 Prada campaign and an editorial appearance in Interview Magazine showcasing the season's key constituents. Inoubliable Model Army is placing bets on Hiemstra to truly make a mark with her "shock of the new" brand of beauty at the impending Fall/Winter 2013 collections. Inoubliable Model Army chatted exclusively with Hiemstra about the advantages of not being a "babe", playing Santa with Patrick Demarchelier, and embracing her "angry bird look". 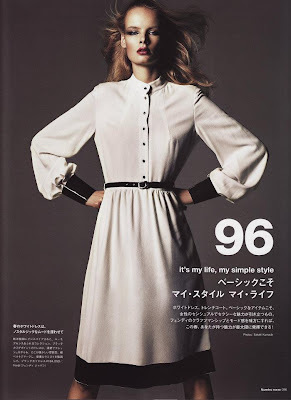 Inoubliable Model Army: Hi Irene, you're a relatively new face to modelling. How long have you been modelling for, how were you initially discovered, and had you given modelling much though previously? IH: I never really though that I could be a model, people usually think I'm very strange looking, not really a "babe"! After looking at some magazines, I thought I'm going to send some pictures to some agencies and then very next day, Paparazzi Model Management in Amsterdam called me and then I started with them right away. I have been modelling for 2 years now, but only 1 year full-time. Inoubliable Model Army: Where are you from and how old are you? IH: I'm from Friesland in the Netherlands (the same town as Doutzen Kroes) and I'm 19. Inoubliable Model Army: You recently appeared at the Spring/Summer 2013 collections in Paris where you walked for Dries Van Noten, Pedro Lourenço, Alexander McQueen and Céline (which you closed). Were you happy with how things went this past season? IH: Yes, last season was a real surprise, and I'm really grateful for Dries Van Noten and Russell Marsh, they really gave me a big chance to evolve! Inoubliable Model Army: Models often have to deal with a fare amount of criticism and rejection during the shows and casting process. How was it for you coming into the show season as a relatively new face, and how did you cope with the stress involved with attending castings where you were up against so many new models looking for that lucky break? IH: Well, I was booked exclusively for Dries Van Noten, so I knew that I was going to do that show, then the other shows were an extra surprise. I really was lucky as I didn't do a lot of castings, I will however do them this season. Inoubliable Model Army: Modelling can be a lonely profession with lots of travelling and time spent in hotels away from family and friends. A big support during the show season comes from the friendships formed with other models. Who are your closest model buddies and what qualities are most important to you in friendships? IH: I'm very social, so I pretty much get along with a lot of people, and find it interesting to meet new people. So I never really feel lonely, though I do miss my pets! Inoubliable Model Army: You are currently the mew model on every casting director's radar and were recently listed in W Magazine's list of Top 10 Newcomers. Since the Spring/Summer 2013 shows you have shot with Patrick Demarchelier for Interview in an editorial featuring the industry's most promising new faces. How was the experience and what was it like working with an industry legend such as Patrick? IH: Patrick is like a Santa Claus! He is this tall, big man, he was so nice and the shoot was so easy. I loved the pictures! 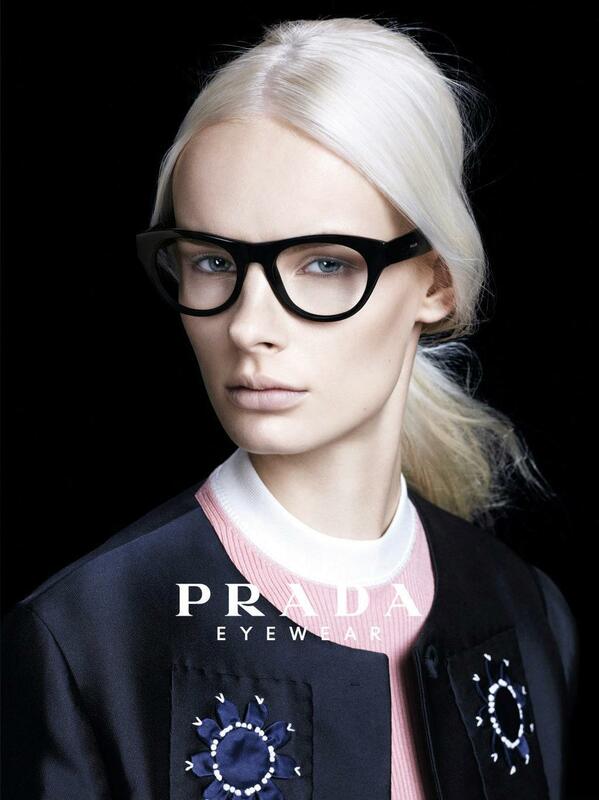 Inoubliable Model Army: Congratulations on scoring a spot in the Spring/Summer 2013 Prada campaign lensed by Steven Meisel! What was involved in the casting process (given that you were not in the show this season) and what did you learn or gain from the experience of working alongside Steven and iconic models like Eva Herzigova, Kirsten Owen, Raquel Zimmerman and Amber Valletta? IH: I was requested to meet Steven after the Dries show, then I came to New York and met him, apparently he liked me. Then came the option and then the booking!! To be honest, I had a panic attack during the shoot but Saskia de Brauw was really sweet and helped me to be calm and then the shoot went really well. It felt like a dream! Inoubliable Model Army: The casting trends this past season suggest a move towards models with distinctive, memorable and bold looks. Did you notice any discernible modelling trends and what do you feel are the factors which have contributed to your recent success? IH: I really don't know as there are so many special and beautiful girls! I think it's difficult to follow model trends so I just try to be me and to do my best. Ioubliable Model Army: What do you love most about modelling and if there was one aspect of the industry that you could alter, what would that be? IH: I love the travelling! And I would wish only that there was no such thing as jet lag! Inoubliable Model Army: What is the most valuable advice anyone has offered you with regards to modelling? IH: The best advice is; to be focused and professional, to be yourself and enjoy every day! IH: I think for me the greatest challenge is to understand this business and to learn as much as I can hopefully from all the new projects that I will be doing. Inoubliable Model Army: You recently signed with DNA in New York. Do your immediate plans for the future include relocating to New York? IH: I love NYC! So I hope I will have the chance to go to New York soon!